Margaret Rodriguez was finishing up high school when she was diagnosed with osteosarcoma, a cancerous bone tumor that typically develops in teenagers. But she would wait a few days to make this her focus. Margaret had something else to do first. Margaret finished the chili, then faced tough challenges ahead. Her bone cancer was lodged near her knee, which required a total knee replacement, as well as chemotherapy. Between the knee surgery and chemotherapy, she spent most of her time at Rady Children’s Hospital- San Diego. She got sick of losing her hair and shaved it off. The chemotherapy was the worst part. Because Margaret’s body wasn’t flushing out the medicine fast enough, it was making her terribly sick. Ultimately, her doctors had to shorten her treatment regimen. Still, despite the surgery, chemotherapy, losing her hair and spending so much time away from her family, Margaret stayed positive. 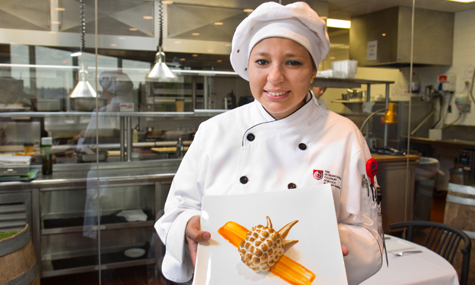 Finally cancer-free, Margaret enrolled in the culinary school at The Art Institute of California— San Diego to pursue her dream of becoming a pastry chef. But then everything changed. Six months later, the osteosarcoma returned. This time, the cancer metastasized to her lungs. She required surgery, and the prognosis was not good. “When cancer recurs, especially with metastatic disease, not many people survive,” says Dr. Ahn. Still, because Margaret had not finished a full round of chemotherapy, Dr. Ahn thought her cancer might be treatable. Understandably scared, Margaret drew strength from her family and caregivers. She also discovered SOMBFAB (Some of My Best Friends Are Bald), a support group at Rady Children’s for teen cancer patients and their teen siblings, and attended adult support groups. She regained hope. “At first, I thought I wasn’t going to make it,” says Margaret. “But it was really encouraging to see people who were past their five-year marks and doing things with their lives. Some people had relapsed a couple of times, but they still went on to have children, even grandchildren. ”Concerned that Margaret would not be able to tolerate much more chemotherapy, Dr. Ahn found a clinical trial for an experimental immunotherapy drug, which was provided along with the chemotherapy. Immunotherapy uses the body’s immune system to fight cancer rather than directly attacking cancer cells. The combination of surgery, chemotherapy and immunotherapy worked. Margaret has been cancer-free for almost two years now. She remains anxious before her regular checkup but tries not to think about a possible recurrence. In September, Margaret graduated from The Art Institute. She wants to work in a bakery and one day own her own restaurant. The introductions are simple: name, type of cancer, on or off treatment. And there’s always a question of the month, like “Who do you think will win the Super Bowl?” Welcome to SOMBFAB, which stands for Some of My Best Friends are Bald. Created in 1990 to provide support for teens affected by cancer, SOMBFAB – part of the Peckham Center for Cancer and Blood Disorders at Rady Children’s Hospital-San Diego—is more than a therapy group; it’s a family. Along with patients and survivors, the group includes patients’ teen siblings, who face their own challenges. “Always about the boy, never about the girl, I feel like I live in an invisible world,” wrote one patient’s sister.